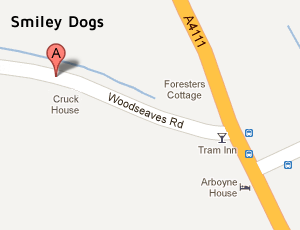 Smiley dogs provides a range of Dog Grooming & Training services (IMDT Full Member) from a purpose-built dog grooming salon in Woodseaves, close to Eardisley, Hereford. I can offer a range of dog grooming and Training services at my custom built salon so whether your dog needs a quick wash or specialist dog grooming or Training, I can help. So what’s included in the full dog grooming service? MOT’s are ideal if you don’t want your dog’s coat to be cut shorter or trimmed during the colder weather but you would like your dog to have a clean and healthy shine or perhaps a spruce-up between full clips. MOT’s will ensure your dog stays free of knots and tangles, has short toenails and, sweet-smelling ears! 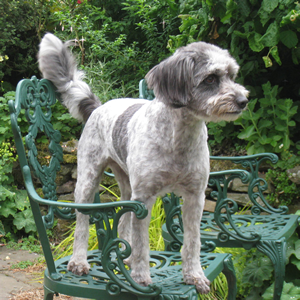 So what’s included in our dog grooming MOT? Cutting of nails including dew-claw. We stress that this will only be carried out if the dog does not show undue anxiety. On occasion we will refuse to complete this task if your dog is not happy and suggest that in these cases you refer to your vet for nail cutting. A warm water bath with full shampoo and conditioning. Fully dried and coat finishing spray applied. Ideal for the dog who’s a "mud magnet" or always manages to find the stagnant pond. Walk-in service sometimes available. 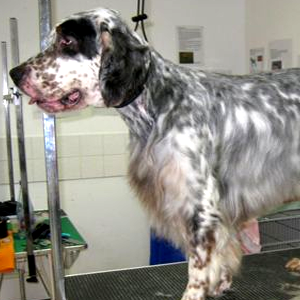 This service may not be available for some breeds, for example Afghans and Setters as these breeds require a thorough brushing out before washing. #1. To treat dogs considerately and kindly at the grooming salon so they enjoy their visits here as much as possible. #2. As a groomer primarily working on my own, I cannot start any grooming process of any of the dogs admitted to the salon until all scheduled dogs have arrived. I therefore encourage all owners to be prompt when bringing their dog to me. #3. 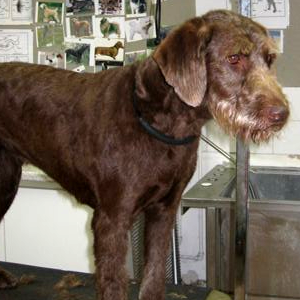 To produce a trim that is as close as possible to the breed standard. This will be compromised to suit specific requests from owners (perhaps to suit their lifestyle) and to ensure maximum comfort of the dog. #4. To keep your dog safe at all times - this is achieved by keeping all equipment sterilised and in excellent condition as well as ensuring dogs are safely restrained during grooming. #5. Each pet I groom or train is very special. I feel the joys of a new puppy, the concerns of a medical finding or the ageing and loss of a pet I have been honoured to know and groom. I care about you as the owner and what you think and feel. Please consider me as your friend, after all we have something in common; a love of animals and your beloved pet. #1. Brush your dog regularly between visits to prevent knots having to be removed, thus ensuring a more comfortable grooming process. Start a grooming routine shortly after a visit to the salon and this way grooming will be easier as your dog will have a tangle free coat. Ask about brushes and combs that would be suitable for your dog and I will be happy to advise on grooming techniques. #2. Give me an idea of how much time you are able to spend brushing your pet. Describe what sort of activities the dog is involved in. For example do you go for lots of walks? Does your dog love jumping in water or rolling in mud? The more information I have the better idea I can get of the type of trim best suits your dog. If you have a busy lifestyle and hate brushing we can go for a shorter trim, whatever suits! #3. Keep regular appointments. A proper dog grooming regime for your pet includes salon visits and brushing at home and is one of the most important parts of responsible pet ownership. #4. Be honest if your dog has a tendency to be snappy - this does not mean I will refuse to groom your dog but I will be better prepared if I know there is a possibility I may be bitten. #5. Do not bring your dog if he/she is unwell. #6. Walk your dog before he/she arrives. #1. At no time should a dog be left unattended on a grooming table or in a bath without the groomer being there at all times. A dog, for safety reasons and control, is leashed to a grooming bar on the table, or is attached by leash to a secure point in the bath so that the dog cannot jump out/off thus causing a potentially serious injury. #2. Dogs are taken for a short walk before the grooming process begins to ensure they have relieved themselves & are comfortable. #3. When the dog is not being groomed they are kept on their own in a secure dog crate with a blanket & water. All of the crates are located so that the dogs can see into the grooming area, & I can see them. #4. All electrical equipment is safety checked and maintained annually.